Enzo Siragusa’s London clubbing institution commemorate the last 10 years with two London events across 24 hours on the weekend of their tenth birthday in November. The UK tour continues in December with a showcase at Mint Club, and a gig for the In:Motion series in Bristol before announcing international dates in the New Year. FUSE London kick off their tenth birthday celebrations with 24-hours of rave in London. 10pm – 10pm. 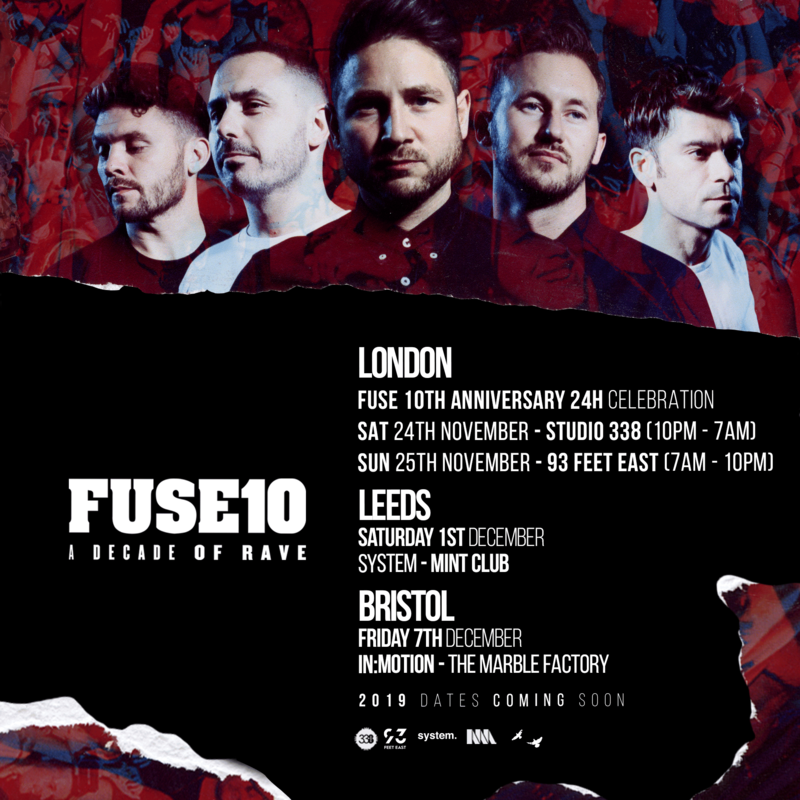 Part one will take place on Saturday 24th November at Studio 338, where FUSE have held some of their most impressive UK showcases of the last decade. From 10pm – 7amthis is an all-night long affair where the five residents take centre stage to command the 338 Terrace utilising monumental production and sound. Part two continues at 7am from their original intimate East London stomping ground 93 Feet East for an emotionally charged reunion. All five residents return to play alongside a selection of close friends and guests from the 93 era for the first time together since the abrupt closure in 2012, which never gave them the chance to properly close a chapter on four incredible years at the venue. FUSE 10 at 93 Feet East will do just that for the last time. The UK tour then heads to the pivotal Mint Club in Leeds on the 1st December. A venue that is close to Enzo’s heart and one that adheres to his same ethos of throwing high quality raves from the perspective of the dance floor. Following this on the 7th December, the crew goes to Bristol’s The Marble Factory to join the acclaimed In:Motion series. This summer saw their debut at the city hosting a day time terrace party at Motion. For FUSE 10 they will upscale to a bigger night show. The humble beginnings of a Sunday after party on Brick Lane that started in the winter of 2008 quickly developed into a weekly ritual for like-minded DJs and ravers all seeking something extra from the standard of London’s club scene. The years at 93 Feet East were a landmark era that laid the foundation for what was to come. The venues sudden closure in 2012 meant a new dawn as FUSE moved on to the larger Village Underground, where their sub label INFUSE parties reside. Ibiza runs parallel to their London roots starting at Delano Beach in 2009 and growing to residencies at Sankeys, the legendary Space Terrace and Amnesia which helped to broaden their international community and lead them to spread their wings even further to host events at respected venues and festivals across Europe, including Sonus festival, Off Week, and for ADE at Warehouse Elementenstraat. Although FUSE have built a family of guest DJs across the globe, they developed organically into an international tour de force centered around five residents alone. Enzo Siragusa, Seb Zito, Rich NxT, Archie Hamilton and Rossko. A decade later, these five artists will continue to steer their interpretation of the sound of London to new heights across the globe during the FUSE 10 tour. International dates to be revealed in the New Year. More info on the UK dates below.